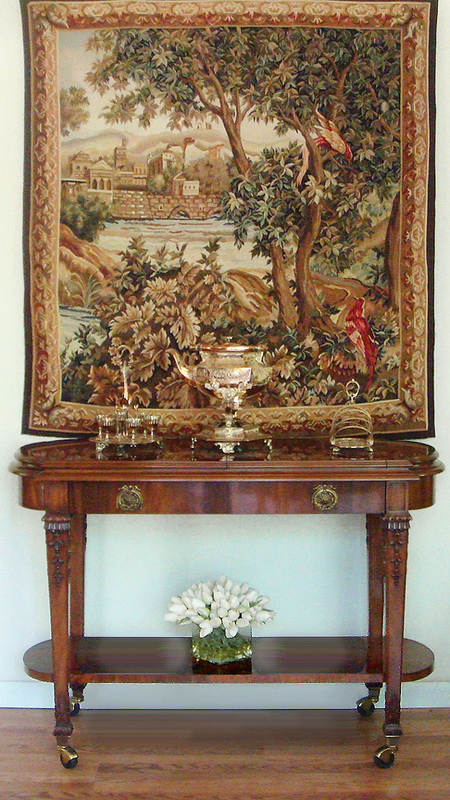 Nejad’s Handmade Wool Pictorial Tapestry – paired with a Karges Server – makes an elegant design statement. Philadelphia clients have purchased from Nejad Rugs in Bucks County a beautiful, fine handmade wool tapestry to hang above their Karges server with antique English silver pieces, creating an elegant dining room niche. Nejad Rugs has one of the area’s largest in stock inventory of new and antique handmade tapestries. This entry was posted in Designer's notes and tagged Nejad handmade wool pictorial tapestry with Karges server, Nejad Rugs has one of the area's largest in stock inventory of new and antique handmade tapestries, Philadelphia clients purchase a fine handmade wool tapestry from Nejad Rugs by Theresa Nejad. Bookmark the permalink.